The Trenches of Discovery: Why is Ebola so scary? Unless you've been living under a reasonably sizable rock for the last few months, it can't have escaped your attention that the world has yet another terror to throw on the mountain of things we should be scared of: Ebola. The ongoing situation in Africa is the largest Ebola outbreak in history and has seen the disease spread beyond Africa for the first time. 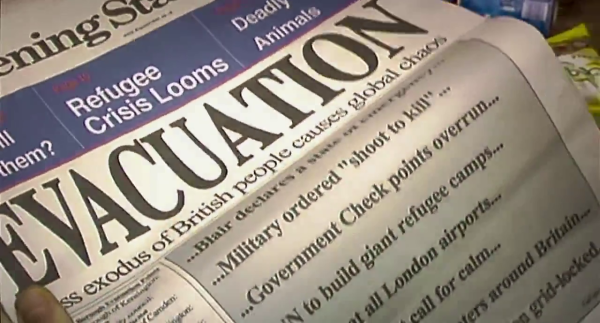 At the time of writing this, nearly 10,000 people have become infected, almost half of whom have died. This number is growing...rapidly. 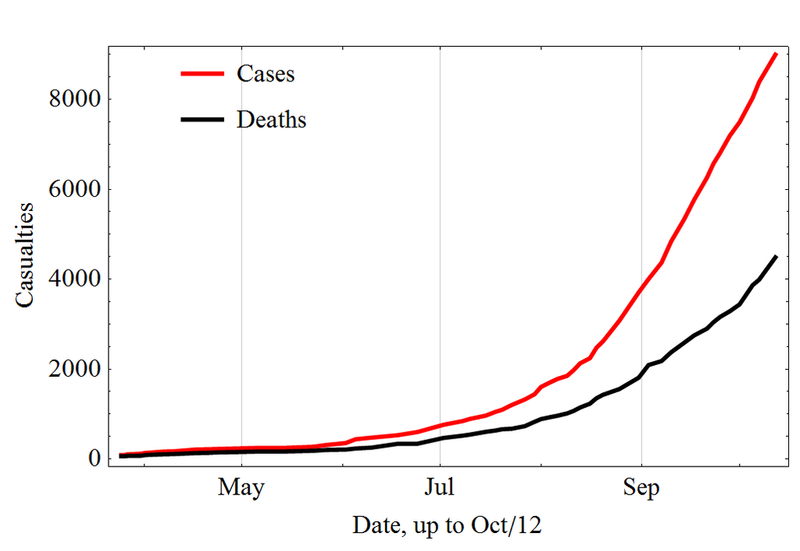 Ebola cases and deaths in the 2014 outbreak. In this post, I will describe what Ebola is, why it is so scary, and what chances we have of defeating it. 'Ebola' as a biological term actually refers to a group of five viruses within the Filoviridae family, of which four can cause the disease generally called Ebola, but more specifically known as Ebola virus disease. The recent outbreak has been caused by just one of these viruses, which used to be known as Zaire Ebolavirus, but is now simply 'Ebola virus' given that it is the most common among humans, and Zaire no longer exists! It doesn't look a whole lot like most viruses, it has to be said - with long, tubular filaments waving around rather than the tight, spherical viruses we're used to seeing for 'flu, HIV, and most others. Like most viruses, Ebola is simple. Frustratingly simple, in fact, as it would be nice to think that as big, sophisticated organisms it would need something similarly sophisticated to take us down. Ebola has a genome made up of RNA, unlike our DNA genome. This doesn't make much difference in practice, but it does mean that the virus can mutate more rapidly as mistakes are made more frequently when replicating RNA than DNA. Influenza also has an RNA genome, which is why every year we need to come up with a whole new 'flu vaccine. If Ebola became widespread, there is a decent chance that multiple infectious strains would emerge, each requiring tailored treatments. Like I say, though, it is still a simple organism. Our genome contains somewhere in the region of 3,000,000,000 nucleotides. The bacterium E. coli has ~4,600,000 nucleotides. Ebola has ~19,000. Its genome only encodes a paltry seven proteins, compared to the 5000 or so in E. coli and ~25,000 in us. And yet it is deadly. When it comes to biological warfare, complexity doesn't necessarily correlate with efficacy. Ebola's complexity is about average for a virus (HIV and influenza have genomes of ~10,000 nucleotides each, for comparison), and yet viruses are generally far deadlier diseases than the more complex bacteria that also attack us. This is because viruses are extremely streamlined replicative machines. They only have what they need to replicate, and they make that machinery extremely efficient. The key components of Ebola that make it so deadly are the proteins GP, VP24, and VP35, and they are very good at their job. The role of GP is very simple - it gets the virus into your cells. If you were to become infected with Ebola, GP proteins on its surface would bind to corresponding NPC1 proteins on the surface of target cells in your body. These are mainly endothelial cells lining the walls of blood vessels, but also liver cells and some cells of the immune system (specifically macrophages and monocytes). Binding of GP to NPC1 allows the virus to fuse with and enter your, now infected, cell. Ebola is so infectious because GP recognises and binds to NPC1 very efficiently, and this binding event is extremely effective in allowing viral entry. This is the reason for the characteristic hazmat-style suits worn by health workers in Ebola wards - it really doesn't take much exposure to the virus to become infected. If even a few tens of viruses find their way into your system you have a strong likelihood of developing the disease. For comparison, it typically requires thousands of influenza viruses, or hundreds of thousands of HIV particles, to allow infection. Once inside the cell, Ebola replicates furiously in the typical manner of viruses; by using the replicative machinery of the cell to produce more virus particles. Each new virus buds off from the infected cell taking a piece of the cell membrane with it. Ebola replicates so efficiently that infected cells rapidly become overwhelmed and die, spilling their guts into the surrounding space. This is what kills Ebola victims - the loss of blood vessel integrity causes by massive endothelial cell death means you start to bleed through pretty much every part of your body. This is the cause of the most horrific symptoms of Ebola: bleeding into the eyes, into vomit, and into other bodily fluids. This effect is made worse by the fact that dying cells release a variety of chemical signals (such as TNFa, IL-6, and IL-8), which normally serve to recruit pro-inflammatory and immune cells to the affected area in order to mop up any pathogens. In the case of Ebola, the tissue damage is so severe that the inflammation just causes yet more damage - hastening the demise of the poor infected individual. Ebola is uncommonly lethal among viruses; typically killing between 50-90% of those infected. For comparison, the Spanish Flu outbreak in 1918 had a lethality of 10-20% and that wiped 100 million people off the face of the Earth. The other proteins that I mentioned, VP24 and VP35, help the virus to evade the immune system. Both proteins act on different components of the interferon response pathway, which normally promotes the expression of antiviral proteins upon infection. Its inhibition by VP24 and VP35 allows Ebola to replicate more quickly in infected cells and thereby spread further. This means that viral load in bodily fluids remains extremely high right up to the point of death. Given that the victim is usually losing these fluids from all orifices, they become extremely infectious, which is why Ebola has spread so rapidly in affected areas. Most of what I've described so far is pretty alarming. The symptoms of Ebola are terrifying and its lethality is one of the highest of all known pathogens. For that reason Ebola is an extremely scary virus if you happen to have it or be near to someone who has it. However, for the rest of us, its lethality is actually a blessing in disguise. This is because, even though Ebola is a deadly virus, it is a poor pathogen on the whole. This is simply because Ebola kills people too quickly and too commonly. Pathogens can only survive as long as their hosts are alive. That's not to say that they definitely shouldn't kill their hosts in order to be successful, just that they need to do it after the host has infected others. This ability can be expressed as a pathogen's basic reproduction number, which is the average number of other people that one infected individual will infect over the course of their illness. If this number is below 1 then eventually the pathogen will die out. For Ebola, it is just over 1. Other viruses have a much better balance of infectivity and lethality. Those that are highly infectious have evolved to be less lethal, meaning they produce short-lived but intense symptoms, as with influenza (with a basic reproduction number of about 3). Others have retained their lethality but reduced their severity, so that infection is ultimately fatal but is long-lived enough to allow transmission, as with HIV (BRN of about 4). Ebola is both highly lethal and highly severe, so infection is too short in many cases to allow transmission. Its only saving grace is its extreme infectivity, without which it would have died out long ago. The reason why Ebola is not very well adapted to life in humans is because it only started infecting us relatively recently. Normally Ebola hangs around in fruit bats, to which it is far better evolved and so far less deadly. The first recorded case of human infection was only in 1976, and it's just not had long enough to adapt to us. This is bad in terms of its lethality, but good in terms of disease control and possible treatments. Because of Ebola's severity, an infected individual is only infectious to others when they are showing obvious clinical symptoms. It is therefore relatively straightforward to identify and isolate those who are infectious - a strategy that has proved highly successful in Nigeria during the recent outbreak. As far are treatments go, Ebola shouldn't be too difficult. Pathogens that are well evolved to the human immune system can be very tricky to treat because they are so well adapted to avoiding it. HIV, for example, has been the focus of an enormous research effort for over 30 years and we're still no nearer to developing a vaccine. This is because HIV is wonderfully evolved to evade our immune systems using a 'shield' of sugar molecules to hide its surface proteins away from attacking antibodies. Ebola has no such defenses. If you can survive Ebola long enough, you will eventually become immune to it. Many people who have lived through Ebola have now become serial blood donors as their antibodies are very efficient at neutralising the virus. Using this as a strategy, several Ebola therapies are being developed that basically involve intravenous administration of neutralising antibodies against the virus. The most promising treatment appears to be a cocktail of three different antibodies known as Zmapp, which can clear Ebola from rhesus macaques with a 100% survival rate, and has good success in preliminary human trials. Crucially, Zmapp is effective even if only given after symptoms have presented, which is the major advantage over previous treatments. Zmapp is being made in tobacco plants (although the antibodies are entirely human), which gives the potential for large-scale production and hopefully means that the current Ebola outbreak will be the last. The only real possibility of Ebola becoming a global pandemic is if it evolves either a new means of transmission (becoming airborne is the real worry) or a more sophisticated method of avoiding the immune system. Neither is likely, but both are possible - particularly given its aforementioned RNA genome. The longer Ebola remains within the human population, the greater the likelihood of this happening. Many people, myself included, are hopeful that we will eradicate the virus before it has a chance to adapt. For all our sakes, let's hope we're right! Thanks for this informative perspective. Great article! It's a very informative text but your panic is highly exaggerated. It's just one disease among many, and a minor one. HIV and tuberculosis, among many others, have the same potential for exponential growth etc. But at some moment, diseases simply stop growing. 1.5 million people die every year of tuberculosis if I count 0.4 million who are HIV-positive. Additional 1+ million die every year "from" AIDS - from non-TBC diseases that wouldn't be lethal if they hadn't AIDS. I could add extra diseases. From this viewpoint, Ebola is just "cute". It's fashionable.But it's not really new and it's not really qualitatively different. Every disease has a chance to become the Exterminator but there are people who have been cured of Ebola already, so it's clear that this won't kill us. And most likely, it won't go above this O(10,000) scale. Hi Lubos - thanks for your comment but I can't help feeling you perhaps didn't read the whole article since the final point I raise is that Ebola is a poor pathogen and unlikely kill large numbers of people. I would read those sentences too quickly, apologies for that.